Found one file extension association related to Actual Installer and 1 file format developed specifically for use with Actual Installer. If you are looking for a powerful and easy-to-use software installer for your Windows based programs, then Actual Installer is all that you need! This professional tool allows you to create reliable installation programs, ready for distribution, with extreme ease. Now you can forget about time-consuming scripting and manual learning. All you need to do is to fill out the necessary forms and attach the program's files. 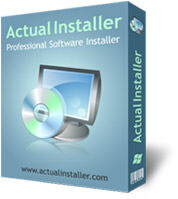 Along with the basic features of software installation tools, Actual Installer provides a lot of advanced, such as support for both 32-bit and 64-bit Windows applications, multilingual installations, customizable dialogs, registry modification, checking the system specifications for their compliance with the program requirements, software prerequisites, file associations, registration of fonts, screensavers and ActiveX components, custom commands and much more! All of these features take just a few minutes to configure and compile into a compact executable file. If you need more information please contact the developers of Actual Installer (Softeza Development), or check out their product website.